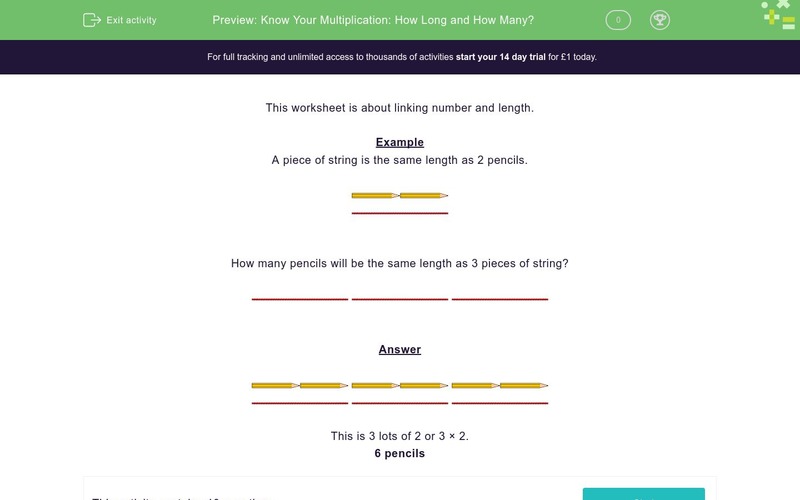 In this worksheet, students begin to link number with length using multiplication. This worksheet is about linking number and length. A piece of string is the same length as 2 pencils. How many pencils will be the same length as 3 pieces of string? This is 3 lots of 2 or 3 × 2. How many pieces of string will be the same length as 4 pencils? How many pencils will be the same length as 2 pieces of string? How many pieces of string will be the same length as 6 pencils? How many pencils will be the same length as 4 pieces of string? How many pieces of string will be the same length as 8 pencils? How many pencils will be the same length as 5 pieces of string? How many pieces of string will be the same length as 12 pencils? How many pencils will be the same length as 6 pieces of string? How many pencils will be the same length as 10 pencils?